Vail jeep tours promise the beauty of Colorado Fall Colors from late September through October when the weather begins to shift. At this time of the year, evergreen forests become spotted with aspen leaves bursting bright oranges and yellows. Aspens are widely considered emblematic of Colorado fall color, and their beauty spreads throughout the high country near Vail. So if you want to watch the fall color come in, a Vail jeep tour is a great way to explore. Timberline Tours jeep guides love sharing local and natural history with guests along the trail. Aspen trees are especially fascinating organisms that are useful for both animals and people, and they add diversity to Vail’s forests. With the first few chilly nights, the leaves of Colorado’s aspen trees begin to change. 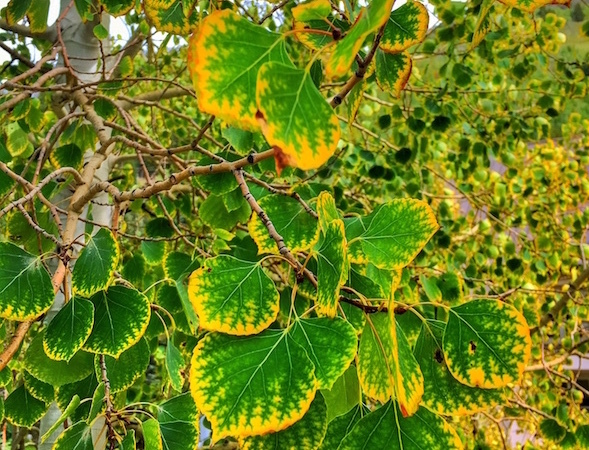 Aspen leaves are nearly heart shaped, and they begin turning yellow at the edges in September. And as temperatures continue to get cooler in the high country, aspen leaves explode into colors that range from deep gold to bright orange. Aspen trees are especially suited to the environment of Colorado’s high country. Aspens need a lot of sunshine, which is something we have here in abundance in Colorado. And although they prefer moist soil, they can also survive in soil that ranges to dry, so they’re pretty adaptable to changing conditions. Aspens group together in what’s called a stand. Stands of aspens are interconnected, and all of the trees in a stand share common characteristics, such as bark markings. 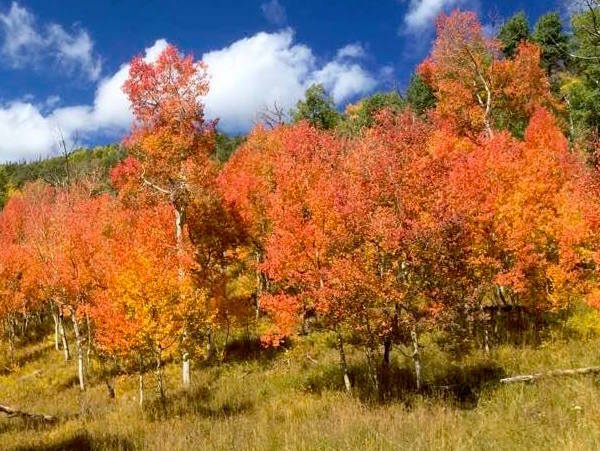 Some aspen stands collectively turn the same color in the fall, like these bright orange beauties. A jeep tour with Timberline Tours will take you deep into the heart of aspen country, where you’ll also explore wildlife and history along the way with a knowledgeable local guide. During the Colorado fall season, wildlife are especially active as they stock up on food for the winter. Bears, foxes, deer, and elk are often sighted along the jeep trail. 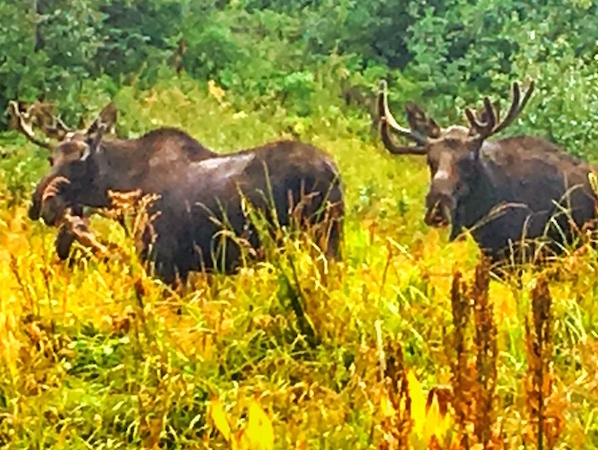 And fall is also an exciting time to get out for some Colorado moose viewing. *Aspen trees are like an interconnected community. One tree is a part of a much larger organism that has an extensive, interconnected underground root system. *Even if a stand of aspen trees is wiped out by a forest fire on the surface, it’s difficult to extinguish the rapidly reproducing root system. This hardy root system makes it possible for aspens to repopulate recently burned and bare areas. *Aspens grow all year long, even in the winter. Their unique bark allows the tree to produce sugars in the winter season when other tree types go dormant. In this way, aspens provide food for wildlife all year long. *The white powdery substance on the outside of an aspen tree’s trunk can be used as a natural sunscreen. Rub your hands against the trunk to cover them with the powder, and then wipe it on your face, arms, or other area you want to cover. *The bark and wood of aspen trees also contains salicylates, chemicals similar to aspirin, which gives them a medicinal purpose for humans and animals, alike. *For more cool facts about Colorado’s aspen trees, see “How Aspens Grow” from the U.S. Forest Service and “Tree Profile: Aspen” from the National Forest Foundation. 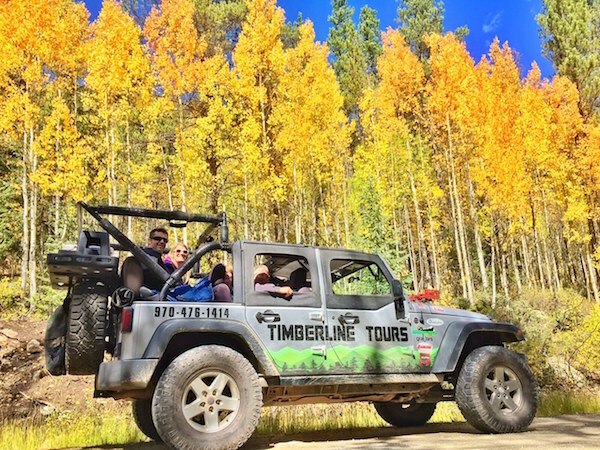 We wanted to share some cool facts about Colorado’s aspen trees with you here, but the best way to have a hands-on experience is to join us for a jeep tour. So check out our Vail jeep tour offerings, and get together a group of family and friends this fall for a jeep tour to explore Colorado’s aspen trees. Timberline Tours offers a variety of jeep tour adventure levels to suit any group. From mild to moderate to hang-on-tight tours such as McAllister Gulch, our guides work with you on the day of your trip to pick the best trail based on group dynamics, available terrain, and weather conditions.